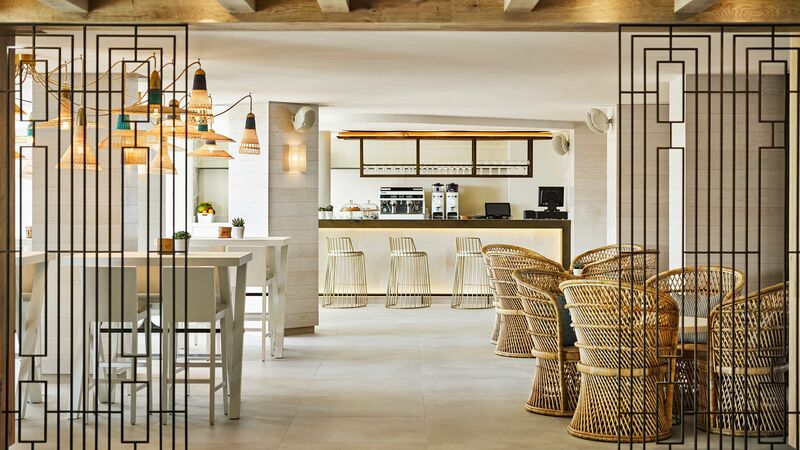 Part of the 'Small Luxury Hotels of the World', Nobu Hotel Ibiza Bay offers the ultimate in luxury, with something for couples, small groups, and families to enjoy. Spend lazy days unwinding on the beach or by the two swimming pools as you listen to chilled out tunes and sip unique cocktails and fine wines and champagnes. For the ultimate indulgence, head to the spa where you can choose from a range of treatments, or head to the John Frieda hair salon or nail bar. Located in Talamanca Bay, enjoy a long sandy beach right in front of the hotel, with Ibiza Town just two kilometres away. Each of the rooms has floor to ceiling windows and a soft pastel palette with pretty touches of gold, blue and aqua. Walk onto your terrace and listen to the sound of the waves as you take in the azure blues of the sea. When it comes to dining you’ll find some of the finest restaurants on the island, including Nobu, a seafood restaurant, and a healthy café with gluten free specialities. Hotel child prices apply to ages 2–12 years. The hotel has 152 rooms and suites. 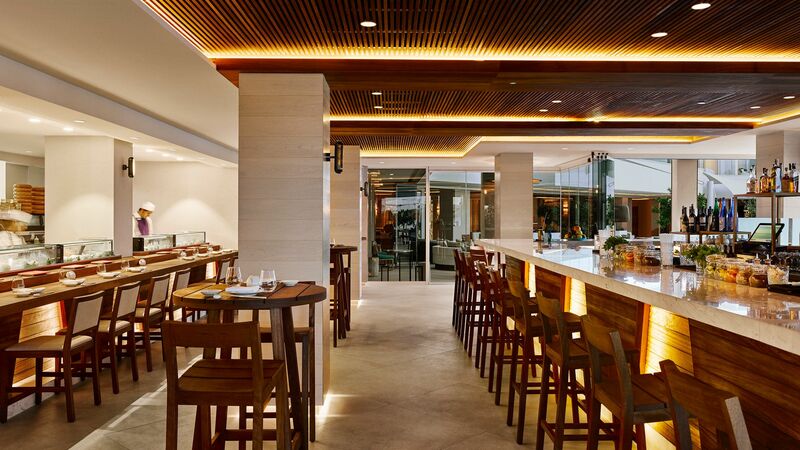 Chic, modern and elegant, Nobu’s design matches its innovative Japanese fusion dishes. Unique dishes to Ibiza are served alongside Nobu’s classic, including Black Cod Miso and Yellowtail Sashimi. Relax and refuel in this stylish café style restaurant where you can enjoy nourishing and healthy dishes, including superfood salads and lots of gluten free options. This laid back beachy restaurant offers rustic details and delicate fresh seafood dishes, including paella, fresh grilled fish, seafood pasta and salads. An excellent selection of wines is served along with exotic cocktails. Relax and take in the views of the sparkling ocean as you enjoy informal dining, light bites and more. The menu includes sushi rolls, fruit platters, juices and cocktails. There are two swimming pools to choose from, each surrounded by a terrace with sun loungers. Listen to the soft house music and enjoy a full menu with lounger service. Professional staff are on hand to keep your little ones entertained throughout the day, with activities, games and plenty of fun. Children can enjoy DJ workshops, arts and crafts, treasure hunts, cookery classes and even a pirate and mermaid school. 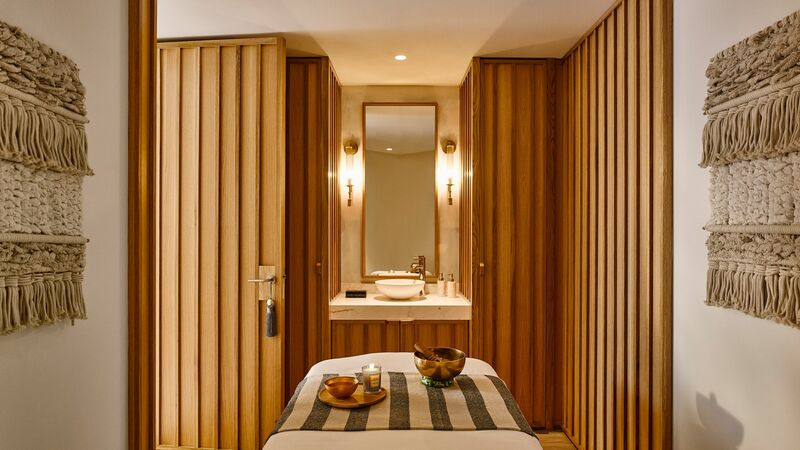 Relax into the serenity of Nobu Hotel Ibiza Bay’s onsite spa where you can choose from massages, facials and body treatments. Styling, blow dries and colours are all offered at the luxurious John Frieda Hair Salon at the hotel. There is also a nail salon where you can enjoy healthy juices. Keep fit or get in shape at the Nobu Hotel Ibiza Bay’s fitness centre. Choose from classes including aerobics and yoga. Browse through local artisanal products at the onsite boutique, where you’ll find ceramics, sea salt, olive oil and designer beachwear. You can also pick up books, magazines and other holiday essentials. 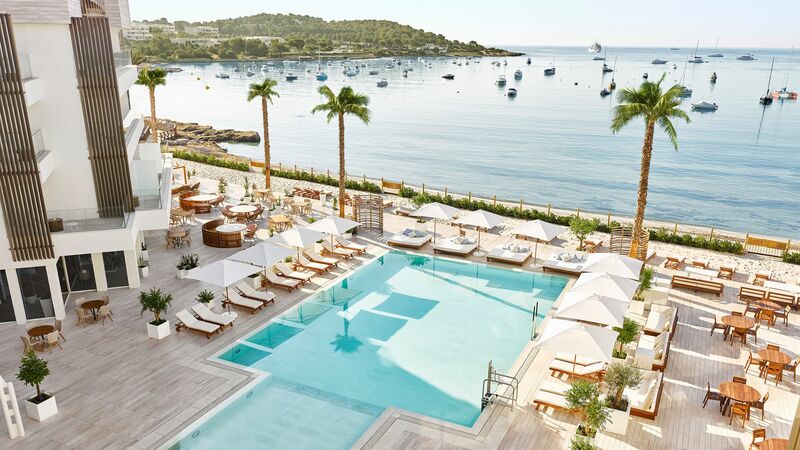 Found on the south east coast of Ibiza, Nobu Hotel Ibiza Bay is close to the island’s golden sandy beach, as well as offering easy access to the amenities of Cala Talamanca. This peaceful beach offers a chance to relax and try out some of the chic beach clubs, with a bustling marina housing luxury yachts and little fishing boats. Ibiza Town, the capital of the island, is just up the road, and offers trendy restaurants, world famous bars and clubs, as well as some excellent shopping. If you prefer to take it easy there are boat trips and snorkelling and scuba diving excursions available from the harbour. Or you could simply spend the day on the beach. Foodies will love the variety of restaurants in Cala Talamanca as well, including a jazz café, tapas restaurants and fresh sushi. 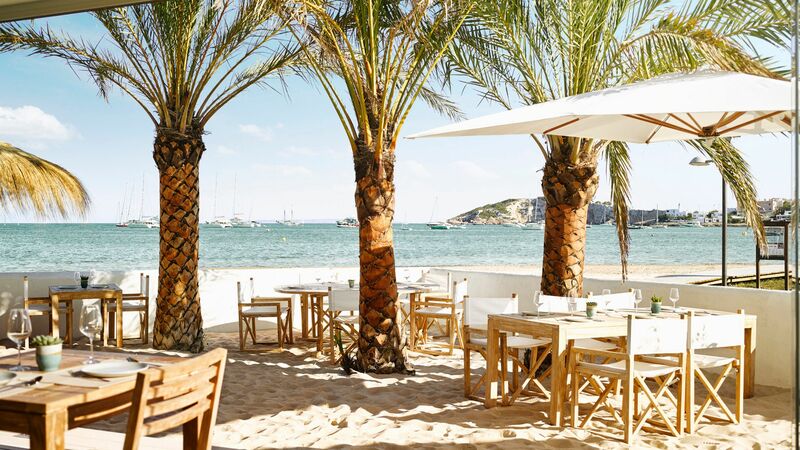 Nobu Hotel Ibiza Bay is a 15 minute drive from Ibiza Airport. Cool Sea View Rooms feature a furnished terrace with views of Talamanca Bay and Ibiza Old Town. The room boasts one king-size or two twin beds and marble bathroom with a rain-fall shower and Natura Bissé® amenities. Facilities include; 48-inch TV with bluetooth capacity, Nexus tablet, iPod® docking station, safe, mini cocktail cabinet and an Illy® coffee machine. Deluxe Garden View Rooms feature either a king-size or twin beds and floor-to-ceiling doors that lead to the furnished terrace. The marble bathroom with a rain-fall shower and Natura Bissé® amenities. Facilities include; 48-inch TV with bluetooth capacity, Nexus tablet, iPod® docking station, safe, mini cocktail cabinet and an Illy® coffee machine. Deluxe Sea View Rooms feature one king-size or two twin beds, lounge area, dressing room and furnished terrace. Facilities include; 48-inch TV with bluetooth capacity, Nexus tablet, iPod® docking station, safe, mini cocktail cabinet and an Illy® coffee machine. Junior Suites Garden View feature a king-size bed, dressing room, living area and furnished terrace. Facilities include; 48-inch TV with bluetooth capacity, Nexus tablet, iPod® docking station, safe, mini cocktail cabinet and an Illy® coffee machine. Junior Suites Sea View feature a king-size bed and floor-to-ceiling doors leading to the furnished terrace. Facilities include; 48-inch TV with bluetooth capacity, Nexus tablet, iPod® docking station, safe, mini cocktail cabinet and an Illy® coffee machine. Deluxe Junior Suites Sea View feature a king-size bed, living area, dressing room and furnished terrace. The marble bathroom has a rain shower and/or a soaking tub. Facilities include; 48-inch TV with bluetooth capacity, Nexus tablet, iPod® docking station, safe, mini cocktail cabinet and an Illy® coffee machine. Deluxe Suites Sea View have a separate living room with floor-to-ceiling windows, a bedroom with king-size bed and a marble bathroom with rain shower and/or a soaking tub as well as a separate washroom with shower. The suite also boasts an outdoor garden and terrace with views of Talamanca Bay.Facilities include; 48-inch TV with bluetooth capacity, Nexus tablet, iPod® docking station, safe, mini cocktail cabinet and an Illy® coffee machine. Save up to 20% on the hotel price for holidays between 01 September - 19 October 2019 booked by 15 May 2019. It was an impromptu vacation so I booked pretty late. As a result, the rate I paid was on the high side, despite it being at the end of the season... With this in mind, I felt my stay was enjoyable albeit at a price... Things I liked: - Beautiful room - Great pools - Nice breakfast - Very adequate gym - Set lunch at Nobu was a steal and very yummy! Things I didn?? ?t quite get: - Pretty slow service at the pool and pool bar, except a lady called Astrid who was super friendly and efficient - The cost to dine at Nobu in the evening was rather ambitious, and I wasn?? ?t sure if that was justified - The beach wasn?? 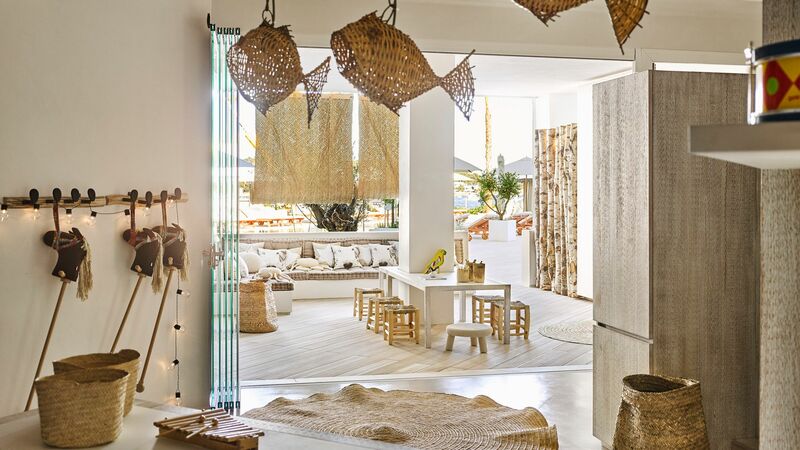 ?t particularly beautiful This hotel is not for everyone but if money is no object and you wish to stay close to Ibiza Town in style, Nobu could be one of your safest bets. Slick, elegant interior. Great food options - but restaurants are open to the public so does get a little busy. Suites are lovely, and the staff are very attentive. Spa was also great - offering a good range of treatments. Overall a lovely new addition to the island - although its a little busy so if you are looking for peace and quite this is not the place. I took 26 men to this hotel and I must say the staff and everyone was amazing not easy looking after that many and keeping the other guest happy. Rooms are lovely with amazing view of the sea. Food also amazing has a lot of options and caters for everyone. It?? ?s a great hotel if you are looking to relax with your kids as they have a family pool as well as an adults only pool. The hotel only opened on 30th June and was already fully booked when I was there in the first week of July. It really is a WOW hotel, 2 amazing pools, lovely rooms, I had a look at at suite too and they are incredible with roof top terraces! The food is unbelievable, everything from Mexican to Mediterranean and of course Nobu which was a real highlight. The island is stunning and not just a "party island" so much to see and do, I cannot recommend this hotel and the location more highly. You can walk to the Marina in a few minutes and the old town is only half an hour away yet Talamanca Bay where the hotel is located is quiet, so you have a down tempo hotel just minutes away from the party scene if you want it. Nobu is an oasis of modern elegance, superior service and impeccable dining of course. The hotel is stylish & beautiful & has a real wow factor on arrival. The best ???feature??? of the hotel is the entire team, who are all wonderful and accommodating. We stayed in a suite which was well equipped & beautifully decorated & also has a huge terrace. Breakfast at the hotel is the best on the island. Already looking forward to returning next year.